Well, It’s that time of year again. My wife always says that you can tell that fall is coming by the little yellow butterflies. While they are beautiful, and there is a very sweet story behind that, it’s not how I recognize the impending arrival of autumn. For me, it’s a bit different. I realize fall is here when the focus falls to football. (Yes, I realize that the rest of the world calls soccer, futbol… and that it is the most played sport in the world… yada yada yada) Here in the South, football is a big deal. I mean huge. In small towns like ours, there isn’t much to do on an average Friday night. So, High School Football brings out the town. You can argue about safety, benefits of organized sports and all kinds of things. But the point is, it brings the community together and gives a common denominator for folks to talk about. Not just football, but all kids sports. The picture is actually from a Junior High Jamboree. 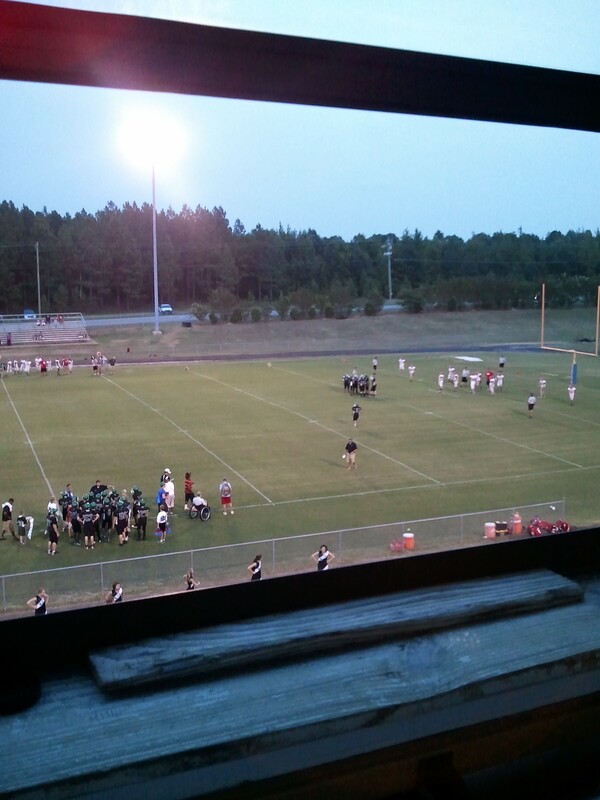 I was in the press box, handling the PA announcements. Now that fall is coming, football will rule the weekends. Thursday brings out the Jr. High. High School follows up on Friday. College gives their all on Saturday. Then the pros bring the show for Sunday. So here is my challenge, go watch a game. Preferably Jr. High or High School. I don’t care if you are a sports nut, or if you can’t tell a pigskin from a horse collar. Just go watch a game. Then ask yourself, when is that last time I put that much effort into something? When did I last work, train, practice that hard? I’m sure there is something in your life that is worth that effort, so go out and make it. Bring your A-Game. Be the best you can be. Get out there and win one for the Gipper. Because, we need that effort. We need to try our best so we know how good it feels. If you’ve been just coasting, just making it though the day. Pull out all the stops. Just this once, and see what happens. You might just like it.